Quite the finish last night in Vancouver…including the two big boys on the left dropping the mitts and throwing some haymakers. The scenario was this…the Vancouver Giants had just scored on a three-man (yes, I said three-man) advantage with 34.5 seconds remaining on the clock to cut the Portland lead to 4-3. At the ensuing face-off, you could tell there was a bit of confusion between the referee Jeff Ingram and the scorers table. Ingram dropped the puck, but the scoreboard clock did not start. Play continued until it was finally whistled dead. 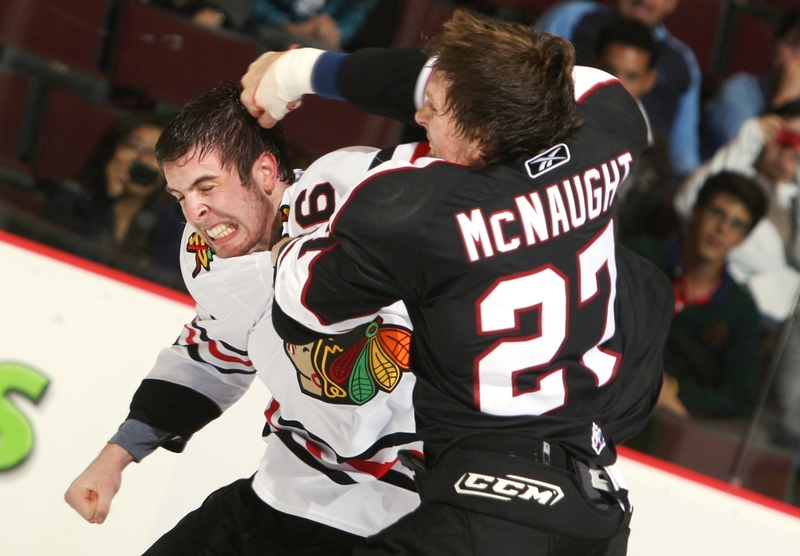 Oh, and I left in the Brett Ponich/Randy McNaught scrap at the end just for fun. In the end, the game ended appropriately with the Hawks skating away with a 4-3 win despite all of the confusion in the building. Not to be lost in all of this is the Hawks breakout second period where they exploded for four goals in 10:17 of game action, highlighted by two Brad Ross breakaways that he finished nicely. And, it was too different finishes for Ross, the first a backhand roof shot and the second a top shelf wrister to the blocker side. Both were incredibly placed shots. Spencer Bennett and Ty Rattie continued their hot play to start the year as each chipped in a goal and Ross, Bennett and Rattie are tied for the team lead with three goals through three games. Keith Hamilton played very solid once again and made his best save in the second period when the Hawks led 2-1. The Giants created an odd-man rush on a 4 on 4 situation and Craig Cunningham set up Neil Manning all alone in front and Hamilton got just enough of it with the pad to keep it out. The Hawks are now 2-1-0-0 heading into Saturday’s match up with Seattle where they will look to exact revenge for the 4-1 loss to the Thunderbirds in the season opener in Kent. Boy the Giants announcers gave every excuse why McNaught got a good old beat down, “He’s tired, 2nd fight of the night” “his hand isn’t right, that’s why it’s all taped up” then maybe he shouldn’t be sticking his stick (hooking Ponich) where It doesn’t belong. He’s supposeto be a “tough guy” right? he should be able to handle two fights…. I think the Giants PXP guys simply go to the Nth degree to be neutral – they slightly more praise on the other team as the Giants. Part of it has to do with jr hockey in that city not being the be-all-end-all, and part of it is catering to the fans being a fan of the game, and not the Giants in particular. They do a great job of seeing the nice plays from everyone, and pointing them out to the Giants fans when they might not appreciate the plays from players they aren’t real familiar with – especially on the radio. This is just my observations, of course. Thanks for addressing the issue with the stream feed. I was beginning to think the guy running the board didn’t know the “stoppage of play” courtesy rule. We, too, switched to the Giants’ webstream (sorry, Andy!) to escape the Credit Union Jingle Torture. The Hosers were saying tons of nice things about Portland! 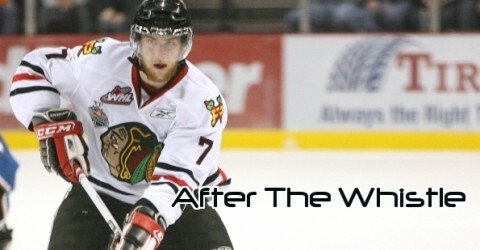 Even commented that the score was not indicative of how well the Winterhawks played. They lied, though: they never told us who got the three stars! Our choices were Hammie, Ross, and Cunningham. Yours…or the real ones? I got it at about 41 seconds. Currently we still have 3 players gone.. Gabriel was just announced as coming back to us from the Blue Jackets… Luke signed and was sent to Lake Erie’s camp and probably won’t be back but there is still the chance. Nino and Ryan are still big ??? both can play up to 9 games with their respective team and still be sent back to Portland. 10 or more and thier teams have to pay their first year salary and thusly would be ineligible to return to the Hawks. I think that is all correct, Andy what’s your take on it? Thanks for explaining that Mike, I’ve played/watched hockey since i was a kid, i just never understood that process. Is there any videos of the 2 goals by Ross? Do we know if Gabriel is playing this weekend against Seattle? And to Duxfan88 your right 1 year is not enough we need them back! And, Gabriel is back in town, I’d expect him to play. Thanks for the link to those AWESOME highlights! Also checked out the vid at the WHL video site with Referree Devin Klein mic’d…very informative. I recommend that to everyone if only for entertainment value. if Nino or Ryan don’t return this year to the Hawks it will be a big blow to the team. I believe both should spend at least one more year in juniors. Unlike what the Lightning did to Jason Weimer.